While a number of families in this country have enjoyed their wealth for generations, certain people have been driven to seek out their own opportunities. Hence, we decided to look into a few rags to riches business stories. Some of these people started off with very little and had many early setbacks, but then ended up with millions or even billions to their names. 1. Welfare mom to billionaire. Before J.K. Rowling published her monumental work on Harry Potter, she was a single mother in Britain who needed help to support her daughter. Before all the fame, success and global clamor behind this worldwide reading obsession, J. K. Rowling was a single mother struggling to raise her daughter after a short marriage that purportedly ended after her then husband kicked her out of the house. Then on the dole she went, but life didn’t end there as she took life by the horns: she worked on a novel even as she was living on welfare. Since then, her novels have inspired an entire Harry Potter empire of movies and merchandise. Forbes has estimated her as being worth around £545 million (approximately $1 billion US), and she has also been recognized as the first author who has made this kind of money through writing. I find her story inspiring because of her persistence — she kept working until she finished the tale that has captivated millions of us. The Harry Potter series has made its mark in history. Rowling managed to become a billionaire in so many short years. The term “supermom” would be an understatement for this woman. Admittedly, what I find more fantastic than any Harry Potter story is J.K. Rowling’s own biography. Her own experiences embody a fantasy I sometimes harbor — creating the stories that set the children’s fiction industry on fire! 2. Survivor of a tough childhood to TV’s wealthiest woman. Oprah Winfrey may have had an abusive childhood, but she didn’t allow adversity to tear her down. Instead, she found immense success as a talk show host. Later, she expanded her media empire with a magazine and her OWN network. According to Forbes, she is worth $2.7 billion. She also started a book club that had a lot of clout and influence among its members and followers; it is fascinating to see how many people she affects each time she discusses a new book. 3. From waitress to money guru. I can’t mention Oprah without invoking her frequent guest, the financial expert Suze Orman. In Suze’s book The 9 Steps to Financial Freedom, she mentions how she was a waitress in her early days. When she decided to open her own restaurant, she raised $50,000 that was subsequently lost due to a reckless financial advisor. Some time after that, she went to work at a brokerage, learning the financial skills that she now shares through her books, TV show, and appearances. The New York Times reported her wealth to be $20 million in 2009. Not bad for someone with a humble beginning. Her story is an interesting example of how to turn lemons into lemonade, and how to find success in a new career. 4. Daughter of immigrants to CEO of a major company. The family of Ursula Burns came from Panama. Although she was raised in public housing in New York, she earned an engineering degree and climbed up the ranks at Xerox. In 2009, she was named CEO and she is now the chairwoman as well. One of the most compelling things about her: she’s the first woman to succeed another woman at a top company, according to Bloomberg Businessweek. 5. Receptionist to head of one of the world’s top brands. You might not be familiar with Indra Nooyi, who worked her way through college as a receptionist. Today, she’s the head of PepsiCo and recently earned $10 million there. Fortune Magazine recently named her the world’s most powerful woman. For anyone who’s started low on the ladder, I think her story is proof that anyone with smarts, tenacity and luck can climb to the top. 6. Mom to worldwide entrepreneur. When Anita Roddick’s daughters were younger, she opened a store to provide for them. The Body Shop became an influential brand that was purchased by cosmetics giant L’Oreal in 2006. Although she died in 2007, she was able to leave her estate to charity. Her story demonstrates that it’s possible to do what you enjoy and earn a living from it. 7. Daughter of a rodeo cowboy to music legend. Lots of musicians have modest origins, but Reba McEntire has found success as a singer and actress, and has also gotten far with her clothing line. She’s sold millions of records around the globe and was recently inducted into the Country Music Hall of Fame. If you’ve got talent, you’ve got a leg up! Use your gifts well and who knows how far you’ll go. If you notice, we’ve showcased successful women in this piece, but as far as billionaires and millionaires go, females are the minority. Still, inspiration can be found anywhere, and can be taken even from the stories of our children! Each of us has it in us to move forward and achieve our potential. Some of us even start off with handicaps, but as these stories can prove, anything is possible. Many people have overcome adversity in spectacular ways. These rags to riches business stories illustrate that success can be found by those determined to capitalize on their abilities and who are willing to work for it. It’s never too late to get started on your own path. Created July 29, 2007. Updated October 24, 2011. Copyright © 2011 The Digerati Life. All Rights Reserved. Thanks for discussing J.K.Rowling. I am also interested in your personal finance tips! Born on July 31st, 1965 in Chipping Sodbury, Gloucestershire, England, to middleclass parents, British writer J. K. Rowling is the author of the wildly popular seven book series of Harry Potter fantasy novels. It all began one day in 1990, when the author J.k. Rowling was travelling on her own on a crowded train from Manchester to King’s Cross. The idea for Harry Potter simply “walked” into the author’s head. The next six years (1990 onwards) witness J.K. Rowling’s marriage, the birth of her first child Jessica, divorce from her first husband, and a move to Portugal. She continues writing Harry Potter and the Philosophers’s Stone (also titled The Sorcerer’s Stone) all through this time. In 1991, J.K. Rowling is appointed as teacher of English as a foreign language in Portugal and moves to Portugal. Here, she works afternoons and evenings and spends her mornings writing. She writes the first 10 chapters of ‘The Philosopher’s Stone’ in Portugal. While there, she meets and marries Jorge Arantes, a Portuguese TV journalist, and in 1993 gives birth to her daughter Jessica. After her marriage ends in divorce she returns from Portugal carrying her three months old daughter and a suitcase half full of her written work. Ultimately settling down in Edinburgh, Scotland, J.K. Rowling continues writing much of The Philosopher’s Stone in the local cafés of Edinburgh throughout 1994 and 1995. Whenever Jessica (her first child) falls asleep in her pushchair she dashes to the nearest cafe and keeps writing. She writes nearly every evening. She completes the First Book in 1995, types it out on an old typewriter and sends it to agents and publishers. Several publishers reject the novel, among them – Penguin, Transworld and HarperCollins – are said to have turned down Rowling. 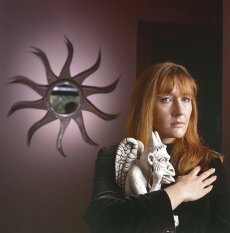 During the 1995-1996 timeframe, while hoping to get the manuscript for Philosopher’s Stone published, Rowling works as a French teacher in Edinburgh. Finally after rejection by several publishers, Bloomsbury snapped her up, paying a reported £10,000 for the rights to Harry Potter and The Philosopher’s Stone and published the first Book, in June 1997. The rest is History. A year later the book is renamed Harry Potter and the Sorcerer’s Stone and published in the USA. Harry Potter Movie 5 DVD. Incredible story. I’m a bit disappointed that the Half-Blood Prince was pushed back. Great story! I loved the Deathly Hallows movie. I agree that Rowling’s story is a great one. Heh, I’d be happy to pay any amount of tax for that kind of break. 🙂 I often wonder how many people out there who’d be capable of finding themselves in this kind of position if only they were given the right breaks. There are almost 7 billion people in this world, with many living in underprivileged areas. It’s like wondering whether there’s someone out there who could possibly find the cure for cancer or send a spaceship to Mars but they’re just not in the right environment for it. Suze Orman is phenomenal! Funny enough, I shot her a tweet once to ask her what her net worth is, and she got back to me telling me she’d never tell! 🙂 I’m a big fan.